Technically, to swoop is defined as sweeping through the air quickly and easily. Here at Velocity Valley, we take swooping to the extreme. The Swoop is one of our top rides here – a giant superhuman swing that you can do solo, with friends or even your frenemies! That’s because the Swoop is the ultimate ride to experience the extreme. Love and hate, joy and terror, up and then down, it’s a pendulum of adrenaline and adventure that’s guaranteed to deliver the greatest rush of your life. Let’s break it down now shall we? Safety first. You’ll go through the Health and Safety aspects of Swoop with our friendly team. Any question, concerns, last wishes should be voiced here. You’ll get fastened into our custom designed hang-gliding harness. 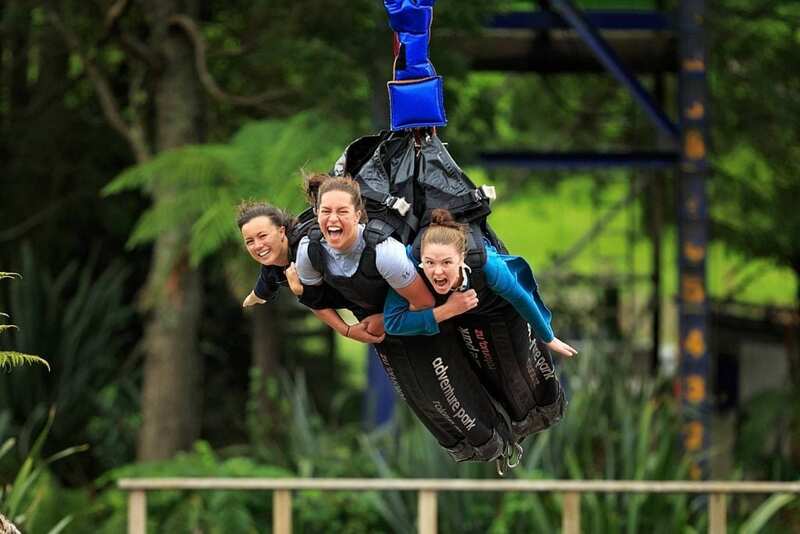 It’s been especially created to maximise your sensation on this hair-raising ride. So you can experience the exhilarating feel of flight to the fullest – we promise you’ll thank us later. Slowly but surely, you’ll be hoisted up 40 metres/141 feet high into the sky. A good time to take in all the views and oh look, how tiny everything looks from up here while trying very, very hard to remember who suggested this was a good idea to do anyway. You’ll get the signal when it’s ready to pull the cord. For some, it takes every molecule in their body and every ounce of sheer willpower to pull that cord and for others, it’s like ripping open presents on Christmas day. This is the moment you’ve been waiting for. You are flying, you are free, you are airborne. You go from 0-130 km/h in 1 second. Plummeting back down to earth, swinging back and forth with the biggest, cheesiest smile on your face. Whether you’re fearless or faint-hearted, it’s guaranteed that Swoop won’t let you down. And the minute it’s over, you’ll want to do it all over again. That’s when selecting a multi-ride package comes in handy. But don’t worry, you’ll get to re-live the experience over and over again because your once-in-a-lifetime moment was all captured on video + photo and saved on a USB stick for you to keep forever.